Constantin Lupulescu went directly into the driver’s seat with his win against Alireza Firouzja in a very exciting and complicated game where the Romanian sacrificed a piece early on. Take a look at this game, potentially the most imporant of this tournament! Gawain Jones and Robert Hovhannisyan drew their game relatively quickly on board 2 but meanwhile Nils Grandelius managed to sail home the win against the red hot David Eggleston. Eggy had won fives game in a row before this won but despite Grandelius winning a seemingly easy game, Eggy missed two massive shots to equalize the game. 35…g5!! would have been a nasty surprise, utilizing the g- or e-files and the pressure on the long diagonal as suffient compensation. The key moment was when Egglestone missed 47…Be2 which would have forced a perpetual. On board 4, Erwin l’Ami got a gift from Andrew Tang in an equal position when the latter blundered horribly with 29.Ke3-e2?? This allowed Erwin to simply to a near winning ending with the simple 29…Rxd3 30.Rxd3 Bb5 31.Ree3 Rd4 and the h-pawn drops leaving black with a passed h-pawn and white with weak pawns on the kingside on g5 and e5. Also joining the pack in joint 2nd place was Armenian Tigran Petrosian. He paid a little bit of a homage to his compatriot when he damaged his opponents structure in a similar way to the 9th World Champion. 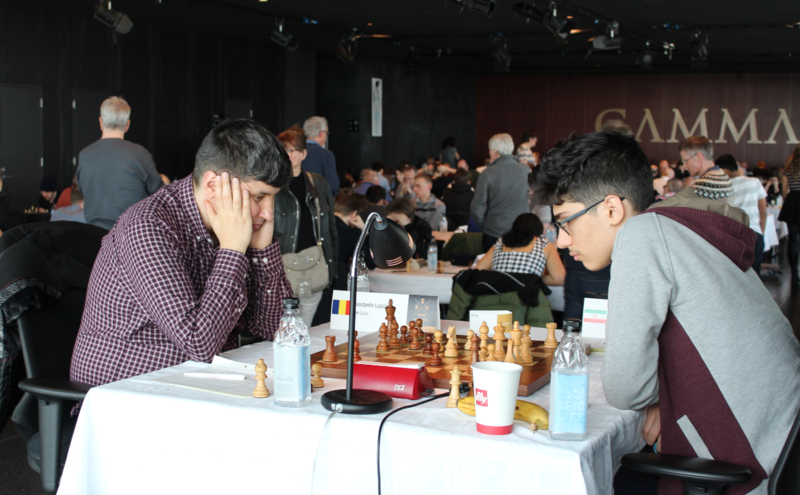 Others joining the big group in joint 2nd were Mircea-Emilian Parligras, Abhijeet Gupta with a nice attacking Sicilian win vs Praggnanandhaa and Kassa Korley who resiliently overcame an early disadvantage in his game against Jorden van Foreest. Finally, Quentin Loiseau decided to take charge for the French contingent and won against Alexander Fier with the black pieces while the top rated Frenchman Maxime Lagarde went down against the undefeated Sabino Brunello who joined the group on 5.5. We continue with round 8 at 15:00 local time (GMT) and at the moment the 2019 Reykjavik Open is Constantin’s Lupulescu tournament to lose. Despite having white tomorrow he faces a tough fighter in Gawain Jones and the pack in joint 2nd place will place their trust in Gawain opening this tournament up for the chasing pack.